In Corning, NY and Steuben County, the temps can get up to 2300°F! At least, they can at The Corning Museum of Glass (CMOG), home to the largest collection of glass art and historical glass in the world. 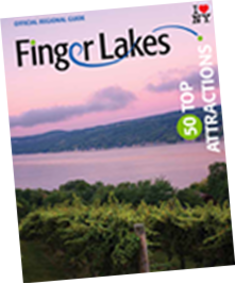 Swing down through the Southern Finger Lakes and you can catch glass-blowing and breaking demonstrations all day long. Explore over 3,500 years of glass history at CMOG or participate in a Make-Your-Own Glass class and take a treasure home for yourself. Steuben County is known best for its rolling hills, sprawling vineyards, glistening water, and for having the “coolest small town in America,” Hammondsport, NY. There is something for everyone here – wine tasting, boutique shopping, farm-fresh foods, award-winning breweries, scenic drives, and some of the best sweet and savory bites you’ll ever have the chance to enjoy. Learn about the origin of naval aviation at the Glenn H. Curtiss Museum or the rich history of boating at the Finger Lakes Boating Museum. Stroll through Corning’s famed downtown, the Historic Gaffer District, and find beautiful architecture and stunning design. Roam the Wild West at the Rockwell Museum, the finest collection of western art east of the Mississippi. Or simply ride down rural country roads and see where the path may take you.